Getting back to the Jagger photo, I have a book called "The Look : Adventures in Rock and Pop Fashion" where the author deemed that era Stones look as "Art School Mod". 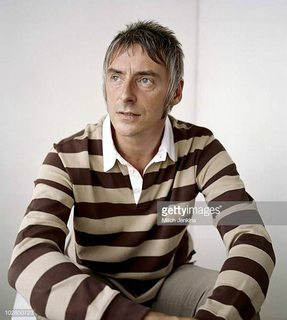 Wouldn't want to see Weller jumping around stage in a "Jam" suit at this point. I'm probably in the minority here, but how many 3 button suits or cycling tops can you own? Thoroughly enjoyed the gig, though. Very much a fan of Steve Cradock's less-is-more approach. Highlights for me were One Bright Star, Man of Great Promise, and Ever Had It Blue? I can't see the entire show, though there are clips on youtube... whatever quibbles people may have with his dress/hair-do, you ave to admit, the man still can put on a show. Agree 100% the clothes and 'Barnet' discussion is peripheral in many respects. When it comes down to it, given the right material the fella is still off the charts good. Certainly the last tour, and of late, when he selects some choice back catalogue songs along with new material the audience is always onto a winner. The recent BBC gig gives a sort of snap shot of that. Just on the rugby shirt look, does anyone else know 'The Eyes'? I quite liked the eye image on their tops and always meant to try it out sometime (but done in a more classy way than them). One of the legendary mid 60s freakbeat bands. Now that you mention the eye motif, I saw it -better done, not as a makeshift deal- not long ago in a made in Italy sweater, but I can't for the life of me remember the brand, sorry. I just know it was in Yoox's page; in fact, I was tempted by it, but I found it a bit striking.